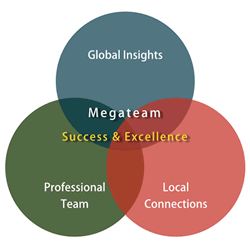 Megateam is a leading Human Resources company based in Taiwan and China. We focus on working with our clients to deliver excellent talents and advisory business solutions to achieve lasting success in the Chinese market. in human resources and talents consulting, we help increase the efficiency of our clients’ operations and adapt to meet changing needs in doing business successfully in China and Taiwan. We work alongside our clients to implement actionable talent strategies, from utilizing the right resources in place to reaching to customers' needs and expectations. We are a committed and trustworthy business partner focusing on delivering value and working right alongside our clients to achieve real success and business optimization. Copyright © Megateam Co., LTD. All Right Reserved.